Joomla is an open source CMS or content management system that is free and makes use of object oriented programming or OPP techniques and software designs and is written in PHP. It stores data in MS SQL, MySQL or the PostgreSQL data bases. It is loaded with various features like RSS feeds, page caching, news flashes, printable versions of pages, polls, search, blogs and language internalization as well. It is one of the most used CMS and has cross platform operating system. Get in touch to get the best Joomla web development services from India. Digital Pugs is an experienced Joomla Development company in India and has skilled developers who have worked with various Joomla based applications and offer customized websites that run on various Joomla extensions. Joomla extensions improve the functionality of the websites and there are basically five extensions that handle a specific function. 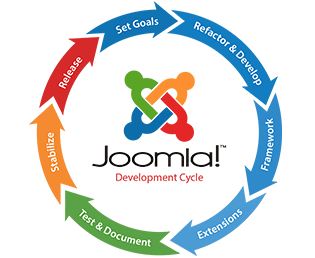 Our Joomla web development services include the following. Template is one the extensions of Joomla on which the layout, look and style of the website depend and we at Digital Pugs have qualified designers who offer our clients numerous customized and unique designs from to choose from. We already have designed the websites of various ecommerce, educational and business websites. Plugins are amongst the most advanced extensions of Joomla that actually are event handlers and modules are extensions that render pages in Joomla. We as one of the most experienced Joomla web developers in India, add plugins, modules and components to improve the functionality of your website. Components are complex extensions that are also considered to be mini applications and our developers can modify all these according to your website requirements. We as a Joomla web development company offer customization services to all our clients. We have the required expertise needed to deal with various Joomla extensions so that we can offer you the best as we believe in 100% client satisfaction. You will have access to search statistics and that is something really good for your business. Content in the website can be managed and edited easily. Template extensions can be customized according to requirements. Images can be uploaded by the browser in the library for future use. Joomla websites run on various platforms like MacOSX server, Linux, Solaris, FreeBSD and AIX. Multilingual. Polls are easy to create and offer many options. These are some of the benefits you will get by using Joomla and by hiring our Joomla development services India.